Ullala, July 02, 2018: The government is planning to set up integrated system of medicines under one roof, said Union Ayush Minister Shripad Yesso Naik. 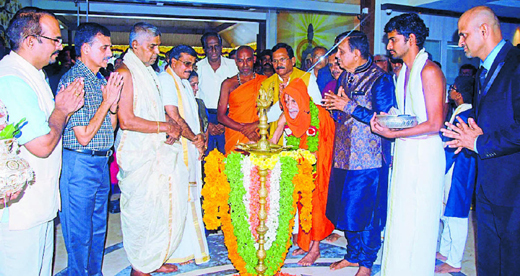 Speaking after inaugurating Sharada Ayurdhama, established by Tulunadu Education Trust at Talapady on July 1, Sunday, he said: “Ayush Ministry has made it mandatory to have biometrics attendance for staff in the Ayush Government Colleges and Hospitals. Minister for Urban Development U T Khader said Ayurveda was not medicine. “It is a good food system. Ayurveda is contribution of Indian sages to the world. There is demand for Ayurveda practitioners even overseas An attempt is being made to sign an MoU to send Ayurveda practitioners to Germany,” he said. Kondevuru Mutt seer Yogananda Saraswathi Swami also spoke. Kateel Durgaparameshwari Temple Priest Vasudeva Asranna, Tulunadu Education Trust Chairman Prof M B Puranik, Vice President Prof K S Kalluraya and others were present. Sharada Ayurveda Hospital which was started in 2016 is now upgraded with more facilities. Karya, Panchakarma and Shalya treatments are available along with obstetrics and gynaecology, Vaghikarana, X-Ray, scanning dental treatment, physiotherapy, emergency treatment, laboratory, operation theatre and other facilities in the hospital.